Among those leading our amazing staff of instructors is studio co-owner, Cody Robbins. Learn more about Cody below. A: Back pain and my chiropractor. My former radio career required a lot of sitting being on the air and scheduling music. When I would stand up I couldn’t straighten up. I was seeing a chiropractor 2 or 3 times a week and he suggested I try Pilates. After a few months my back was better and continued to improve. My chiropractor visits were reduced to one a month. A: The physical change in fitness posture and in movement is fun to see, but the best part is seeing people become inspired, empowered, and confident. They become open and excited to try new things. That carries over into "Life". A: Yes…men, women, young and old. Men are typically “tight” and really need Pilates for flexibility and mobility as well as strength. Pilates was actually created by a man for men, however most men don’t find us until they become injured, or can’t do the things they want or used to do. I once taught a class with a 30 something year old fire fighter, with a strong 70 year old female client. It was a challenge for the fire fighter to keep up with her! A: Safety! The moving surface of the reformer can become a “surfing safari” if one is not mindful. We also do a lot of spine movement and like to make sure everyone is safe and pain free moving into flexion, extension, side to side or twisting. Pilates can also be overwhelming if you are new and thrown into a class with a group of people who have been taking for a while. Our Introductory offers include your first class for $39 and our Introductory Series of 3 Private sessions. A: I do teach classes and they are a lot of fun! Equipment classes can offer a lot of variety using different, or multiple apparatus. I also teach a "Return to Life" Mat Class Saturday mornings at 10am. 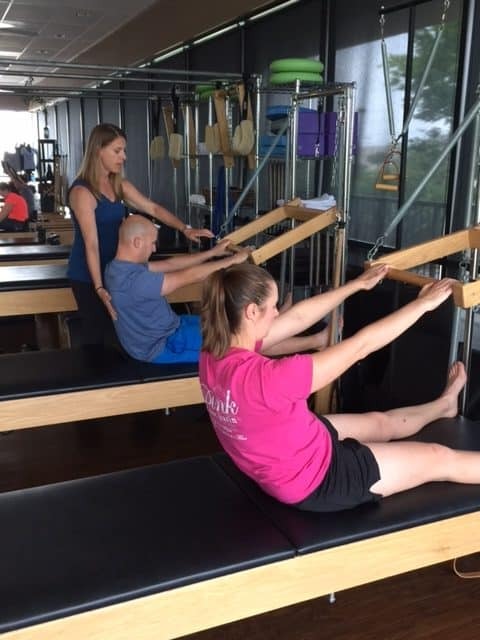 The fascial approach leads to the release of tension in the body, allowing you to move as freely and closely to the way Joseph Pilates originally intended. Q: What is Buff Bones®? A: Buff Bones® is a medically endorsed Pilates Mat Class program for those with osteoporosis or anyone concerned about bone loss and prevention. Buff Bones was created by Rebecca Rothstein, a former dancer diagnosed with osteoporosis in her 20’s. While we do not have a Buff Bones class on the schedule, we have the skills to offer safe and effective movement to anyone with bone loss concerns. The work includes a series of mat exercises and ends with weights, and some stomping. It’s a fun program that is also safe for most spinal issues. Q: What is your favorite Pilates exercise and why? A: There are so many! Favorite feel good exercises are Short Spine and the Rowing Series on the Reformer. I love “Balance Control Arabesque” which is a back flip off of the reformer…because I can do it! The Roll Back on the Cadillac always feels amazing, Pull Up Front on the Chair…it opens the low back and is great on the abs. Short Box Round on the Ladder Barrel is nice because you can go all the way back into extension. For fun, Doing a flip on the Cadillac at 55 because I can! It’s all very, very, good. A: Knee Stretch: Knees Off. This is an exercise I've done for years. Now with the fascial approach, my theory is that my tight lumbar spine is limiting my success in finding the lightness necessary to not affect the knees or activate the quads. My focus on every exercise is to open the spine and to live in my "back skin" organizing myself for this Reformer exercise late in the repertoire. A: The fact that there is always something new to learn. When I learn more I can give more. Our clients then get, and learn more too…The more you learn the more you want to learn. When you conquer a challenge you feel ready for a new one.